American First Ladies are now honored with First Spouse Gold Coins, which are one-half ounce, 24 karat pure gold coins minted in collector proof and uncirculated versions. 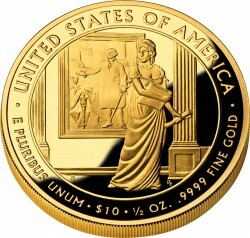 The series of gold coins, introduced in 2007 and set to last until 2016, compliment and are released on the same schedule as the US Mint Presidential $1 program which honors past Presidents at a rate of four gold coins each year. The US Mint normally offers each coin for about a year. When a new one is released, it stops selling the oldest. To keep updated, make sure to check out the coin news section of this site. There are two cases where a President has had more than one wife during service and two coins are issued, like John Tyler. Tyler’s first wife Letitia died during his second year in office. Tyler later married Julia while still President. 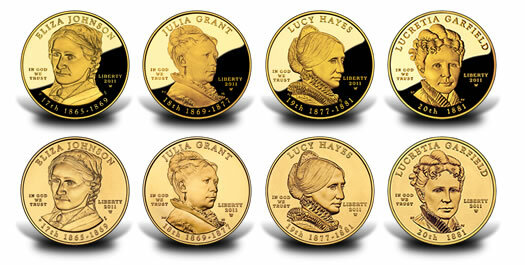 Under the program, the US Mint issued both Letitia and Julia First Spouse Coins. Additionally, the law authorizes First Spouse Medals made from bronze. The 1 5/16" medals bear the likeness of each gold coin and are sold by the United States Mint for $3.50 each. The gold series has included some of the most interesting designs of modern times. The obverse or heads side of the each features a portrait of the the first lady. There are instances when a U.S. President has served without a wife, like Jefferson, Jackson and and Martin Van Buren. For these a design is used which is "emblematic of the concept of Liberty" and represented on a coin during the President’s years in office. Each coin’s obverse also includes inscriptions of the first ladies’ name, IN GOD WE TRUST, LIBERTY, year of minting, the order her husband served, and the years served. The reverse or tails side of each coin depicts a scene typical of the spouse’s "life and work." For example, Dolley Madison’s coin shows a scene of her saving the Cabinet papers and the renowned portrait of George Washington as she was forced to flee the White House in advance of approaching British troops in 1814. A design featuring a theme depicting the President is used when there was no spouse while serving. Included reverse inscriptions are UNITED STATES OF AMERICA, E PLURIBUS UNUM, $10, 1/2 OZ., and .9999 FINE GOLD. Instead of static pricing, coin prices will be primarily determined and actively adjusted according to the London Fix weekly average. The Mint said this was to "mitigate the effect that fluctuating gold and platinum commodity costs" has on coins. The London Fix is used as a price benchmark for immediate silver, gold and platinum delivery. To determine prices, the Mint takes the London Fix gold prices covering the previous Thursday a.m. Fix through the Wednesday a.m. Fix. If this average moves above or below a pre-determined $50 threshold (see pricing policy link immediately above) first lady coins or moved up or down by $25. Just as the pricing policy for the first lady series has changed, so has their mintages. The US Mint initially set a maximum of 40,000 strikes per release. For example, the uncirculated and proof Martha Washington coins had a combined mintage of 40,000. The Mint changed the amount in 2010, cutting down the authorized mintage to 15,000 per release. This site’s sales guide provide the latest sales/mintages per coin. As mentioned previously, spouse coins are issued during the same time frame as their corresponding Presidential $1 coins. This means there are four issues each year, except in cases where a President has had more than one wife while serving. Exact launch dates are usually published for each spouse coin about three months prior to their release. Until then, only generalized times are known, although the year a coin will be issued is, as shown on this site’s release dates page.